Beating the Bounds borrows its name from the ancient practise of marking parish boundaries on Rogation Days. Observed by Christians as days of solemn supplication for the harvest, in the ecclesiastical calendar these are Monday, Tuesday, and Wednesday before Ascension Thursday and were marked by processions, bumping rituals, special prayers, and blessing of the crops, it is still practised in parts of UK today. Set against the backdrop of geographical uneven development and contemporary global displacement, as far back as history documents boundaries are and will be both the cause of and the result of conflicts worldwide. A line drawn on the ground, on a map, a fence, wall, hedge, dyke, stream, river or mountain; boundaries are points of reference can lie between private and public ownership. 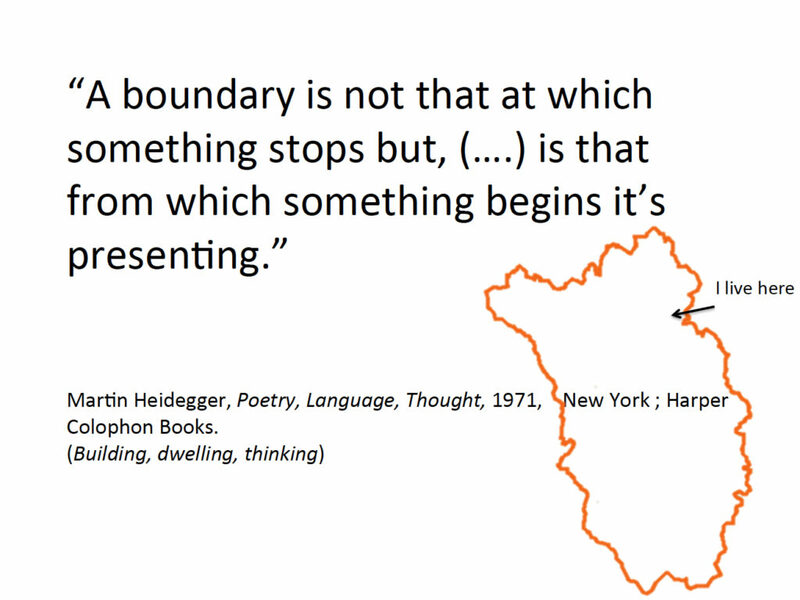 The line delineates not only what is contained, owned and governed, but, because boundaries are relational they become both local and global, material and immaterial contentious places. Fusing together community development processes with cultural and aesthetic pursuits this project invites the viewer to participate in a dialogue which investigates what it means to be an insider/outsider, us/them, here/there. A positionality that links the practise of Beating the Bounds (as an act of remembering where you come from) with notions of home and belonging; providing a wider context in which the cultural meaning and complexities of what it means to be local, national, European and global can be examined. Beating the Bounds is funded by the Arts Council of Ireland under the AICS Award managed by Create, the National Development Agency for Collaborative Arts in social and community contexts.